Arthur Wang, a Kunming China, native, is shown holding the Rose Cologne Keystone Citizen Award, a University-wide award that he received this spring. Yuanheng “Arthur” Wang arrived in the United States for the first time in 2006. His parents felt it was time for him to see the world, so the Kunming, China, native went to live with his uncle in Seattle. He knew there would be only one way to adapt. “I really struggled back then because I basically knew nothing about English. I realized then that I had to master this language to survive,” Wang says. Now a junior at Penn State Erie, The Behrend College, Wang is doing more than surviving — he’s thriving. He has made the Dean’s List every semester so far, has joined the Lambda Sigma National Honor Society, has served as the regional vice president of the Student Pennsylvania State Education Association and was recently accepted into the University’s Schreyer Honors College. His greatest accomplishment though, might be the work he is doing to help his fellow international students, he says. Wang serves as a teaching assistant for Penn State Behrend’s English Language Learners program and holds office hours each week, tutoring students in college-level reading, writing, speaking and listening skills. The English language has resonated with him. “I like English, and I like communication. They just make me excited,” Wang says. In fact, he’s so enthused about the language that English has become his major. Now he’s using that excitement to assist others. 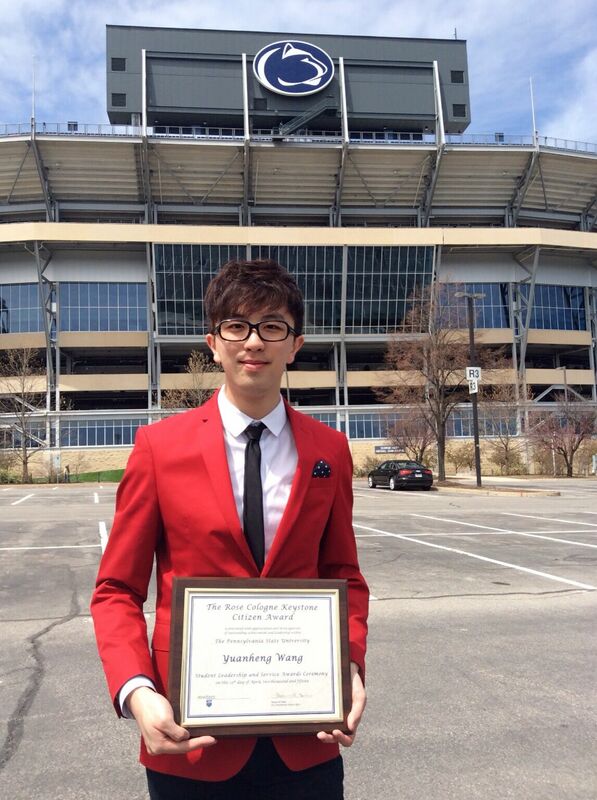 Wang’s efforts were recognized this spring when he was honored with two awards: Behrend’s Irvin H. Kochel Award and the University-wide Rose Cologne Keystone Citizen Award. The Kochel Award is presented annually to an outstanding student who demonstrates character, scholarship, leadership and citizenship through efforts that positively influence students and the college community. The Cologne Award recognizes students for service and volunteerism to their campus and local communities. After graduation, Wang plans to pursue a master’s degree in education or instructional communication and would eventually like to be a professor of language and literacy education. He’s not afraid to challenge stereotypical notions along the way. “I wish to challenge the stereotype that Asian students or international students are not able to major in English or the humanities. I want to challenge the stereotype that says all international students are going to major in business, engineering or the sciences,” he says. Guiding him along the way is a principle he picked up from a speech titled “Claiming an Education,” given by poet Adrienne Rich at the 1977 convocation of Douglass College in New Jersey. He’s hoping other students are willing to follow his footsteps in claiming their education. This entry was posted in Around campus, Fun stuff, School of Humanities and Social Sciences, Student News and tagged Arthur Wang, Behrend, Claim an education, Douglass College, Irvin H. Kochel Award, Penn State Erie, Rose Cologne Keystone Citizen Award. Bookmark the permalink.